Not surprising: Herman Cain's response to the State of the Union address included several disagreements with Obama. Ironic: Cain, a member of the far right who thinks Newt Gingrich is an "outstanding candidate," asked the president to put a stop to "racial innuendos." Classic: He said the "first revolution" is going to involve — you guessed it — "9-9-9" (although he's no longer running for anything that would allow him to implement his infamous tax plan). “Mr. President, most of all, stop the blame game,” he said. 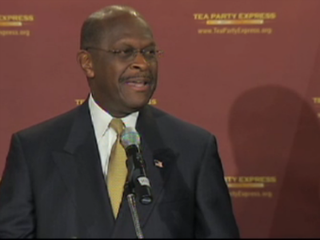 Cain took several questions at the end of his address, focusing on the 2012 campaign and Stephen Colbert’s endorsement of his candidacy during the comedian’s mock presidential bid in South Carolina. Cain said Newt Gingrich has some “ifs” he needs to work out as a presidential candidate, such as some things in his congressional record, but that both Mitt Romney and Gingrich are “outstanding candidates.” Cain added that he plans to work more with Colbert in the future to encourage the youth vote. But “the first revolution, you guessed it, is going to be the 9-9-9 revolution,” Cain said as he left the stage, referring [to] the tax plan that [formed] a centerpiece of his campaign.